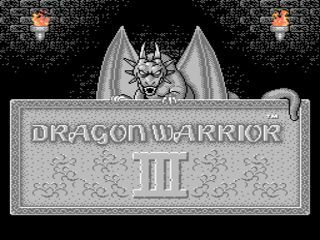 Released in 1991, Dragon Warrior III is the American equivalent of the Japanese game released in 1988 under Dragon Quest III. This is the game that spawned the myth that the Japanese government passed a law forcing DQ games to be released on a weekend so kids wouldn't cut class to go get it. The reality is that they only politely requested Enix to do so. This game is Dragon Warrior to the core, only with a job system! Yay! Best time: 3:36:27 by 'Darkwing Duck' on 2014-04-21, done in 23 segments. All right, where to start (I disagreed with Everhate's suggestion of "metal slimes are magic. baramos are jerks. jazz hands")? I suppose with some history. My first speedrun was this game, and second submission. Started in 2007, finished in 2009. The motivation to return to the run began specifically with Chessjerk's second run of Dragon Warrior IV, which when I verified it, appeared much better in quality than my run. However, serious Dragon Warrior speedrunning never caught traction in any meaningful way (exclude Japan and Nico). Then, last year, Lhexa's segmented Dragon Warrior run came out, which was the final piece to get me to redo Dragon Warrior III, and this is the result. I'm going to write these comments without actually looking at the run. My reasoning is I want comments that aren't 20 pages long, which would be a pretty easy prospect discussing every little decision in any individual segment. I will mention things I remember, however. One particular aspect of this run is its tone. When I first did this run, I wanted it to feel more like a single segment in chunks rather than a human controlled TAS. I had the same goal when I returned to this game. However, some aspects I found while completing this run, things that never really were an issue even on the practice run leading into recording attempts, forced a bit of a change as the run progressed. The amount of segments is for the most part the same. The additional segments are almost all grind sessions. I had 12 in my last run, 23 in this one. I had 7 metal slime grind segments, and 2 metal babble grind segments. Game mechanics are kind of the heart and soul of doing RPG speedruns, and they'll probably be described pretty thoroughly in these comments. I chose the party I did, the same as the previous run, to up my damage capability specifically on bosses and initiative in random battles. There is a hidden element for some enemies. It's called regeneration. At the end of every turn of battles, some enemies, mostly bosses, regenerate a certain amount of health in a small range. Two ranges are important in this run, the 50 range (45-54) and the 100 range (90-109). The actual amount is unknown after every turn. Damage output also helps in random battles as well. In multi-enemy groups, your group's AI will generally target the least damaged enemy in that group unless it thinks it can kill an enemy. For example, in a group with four enemies that have 100 health and characters do on average 30 damage to that group of enemies, the AI will target and attack all four enemies instead of focusing on one enemy to kill it. If the average damage is 55, your characters will two hit kill (THKO) every enemy, leaving fewer actions for the enemy group. Knowing your offensive capability and enemies' HP determine whether a random encounter is best served fighting over running. The running mechanic is very simple. On battles that are runnable where the hero isn't 10 levels about the highest level enemy, you have a ½ chance of running. If you fail, you have a ½ chance of running the second try. If you fail that, you have a ¾ chance of running the fourth try. If you fail that, the fourth try is a guaranteed run. After failed runs, not every enemy is guaranteed to have an action. Agility has no factor on the ability to run or not. Returning to the party choice, fighters have a tremendous critical rate ability. Every character has an innate 1/64 chance of preforming a crit. Fighters, if that check fails, gets an additional level/256 chance to crit. Their agility gives them initiative most of the time. These two factors give them the edge over the soldiers' high HP and armor options. One change that might be made in the future is switching out a fighter for a wizard. Can grind on bomb crags sooner, but has no crit potential for metal slimes and is much more squishy. Pros and cons either way. The first "slice" of the game is from the beginning to getting the ship. More specifically, beating the boss that essentially unlocks the ship. His name is Kandar version 2. His first itterance is skippable and unnecessary to completing the game. His second form, later, isn't skippable. Kandar 2 is also the first encountered enemy with regeneration and is the first major roadblock. Pretty much everything early game is designed to kill him as fast as possible. At least, that was the original plan when the run began recording. The first segment doesn't change much from the original run. I found I didn't need the chain sickle for the trek to the Thief's Key, so I do not use the trick of selling off three soldiers' original equipment. I keep the starting copper sword on the hero and immediately go for the key. The idea is to at least get to level 3 by the time I arrive in Reeve after getting the key to maximize survivability on the way to Romaly. I buy lots of herbs and plan on staying well stocked throughout the early slice of the game since I have little healing magically. I also need the hero to be level 4 at the end of the segment. Casino tickets are Hero's level times ten, and having tickets be 40 instead of 30 really ups the return on the manipulation I do in the casino. The Cave of Enticement is pretty difficult to get through at the level and party I do it at. Every enemy is dangerous for a variety of reasons. Have to find the few battles to fight as I can to get to level 4. The casino manipulation is a bit weird. Through trial and error, it's predictable, but once you leave town and get into battles, the casino battles randomize again. The segment is designed to afford a couple of iron claws for the fighters and a weapon for the Hero. Segment 3, the trek from Romaly to Isis, is the weak point of this party. The original plan was to be at a high enough level for the Hero to know Return leaving the Pyramid, so I wanted to be around level 7 for the hero when I first get to Isis. To get there, I need to grind a bit. With a wizard, bomb crags are the solution. Without a wizard, the choice is much more difficult. I decided to do the bit of grinding necessary in the tower of Shanpane because of the money chest that's in there which would allow me to grab the third iron claw. Three things happened in this segment, one that took many tries to get. First, I had already known a bit about the encounter table. If you reset and move the same way into the overworld and start walking around, then you'll run into the same battle every time. In dungeons, the number table moves every step. In the overworld, it moves every second or so. In this segment, I began to take more advantage of that to avoid any battles before entering the Tower of Shanpane. Second, when I would get into that first battle in the Tower of Shanpane, I found I was getting four or five repeatable battles and that the couple battles after that had similar results, which never got explored much until the next segment. Third, I got to Isis one level lower than I had planned. Segment had to be kept since I finished the segment four and a half minutes faster than any other completion to that point. The run really started to change after that. Armed with a bit more knowledge on how encounters worked, the next segment became more of a search than a sludge through attempts. Through trial and error, a path to traverse the pyramid was found. A wing of wyvern was required to obtain, since my planning had been to have the hero learn return during the pyramid section. That would not happen anymore, and I had to procure one through the mummy man chests. The original segment on the old run beat Kandar ver. 2 immediately upon getting to Baharata. I made the choice here just to go to Dhama and save since I really didn't want to do the entire segment again. And since I was at Dhama, it didn't make sense for me to just go after Kandar. This was the grind spot, and the previous segment had shown me a bit how the encounter table worked, so I decided to do the grind there. I won't go into too many specifics, but it took quite of bit of time to both find metal slime battles, and after the first one, multiple metal slime battles, and even more time to find a successful kill of metal slimes once I found the battle. The next eleven or so minutes of the run took the longest time to do by a wide margin. In the time after the run has been completed, there have been more revelation on how encounters work, so it would take less time now than it did then to find the proper battles. At this point, to generalize the run, there are a ton of options with not a ton of deviance. Redoing the run would study what routes would be slightly faster to take on how many metal slimes to grind, when to beat Kandar ver. 2, when and if to get the Book of Satori to get a sage, how and when to get metal babble kills (way it's done in the run is not repeatable now; would have to find new way), what optimal way to get final key and orbs. Manipulating every segment to predict battles seems uninteresting over the long term, though. All the rest of the segments up to the last three deal with the questions in the previous paragraph, and don't require much to comment on. The third to last segment is Baramos, a tough battle since he has two attacks per round and has eight actions in a repeating list, thus he's predictable. In segmented, the sage must get off sap, and then a few critical attacks are needed. I planned on putting the hero in the back, but sometimes the game reads double inputs and I ended up talking to Baramos before I could do so. Worked out in the end. The Alefgard sections are fairly straightforward. First segment is getting the rainbow drop and the Rimuldar return, and the second is finishing up the game. I get zero armor that grants breath or spell damage reduction, making these segments much more problematic. There have been a few strategies found to make some of the real scary battles more favorable, and a revisit would make the trip through Zoma's castle much easier. I'd also hope for some better level gains, giving me more MP for the sage AND hero. The final battle is all about Zoma not using his freezing waves or strongest breath attack, totalling 3 of his 8 possible commands. I get fairly bad luck in this attempt. I suppose this run was a long time coming and crushed my previous SDA time. This run has also led to pretty efficient RTA attempts of this game, which are getting close to challenging this time. A revisit of the game segmented would set a goal of under three hours.